Project Scope: With over 37 years of combined experience in multiple areas of the real estate industry, including sales, property management, title/escrow, mortgage lending, and notary services, Empire Property Solutions is is your professional real estate team. User Tools: Graphical interface allowing easy maintainance of their rental properties including all content, images, address, links to Google maps, school districts, etc. and also rental articles. 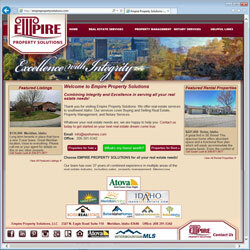 Custom database interface for self maintenance of rental property listings and full MLS / IDX access.